Grow your own tiny red and yellow parrots. A plant with instant appeal and not often available to buy, the exotic-looking Parrot plant (Impatiens niamniamensis) is definitely out-of-the-ordinary. Also known as Congo cockatoo and parrot impatiens its waxy blooms of yellow and crimson resemble tiny red and yellow parrots. A tropical relative of the ordinary Busy Lizzie, it's easy to grow and fascinating for children and adults alike. A flamboyant pot plant in the greenhouse or conservatory where it can reach over 4ft, the parrot plant also makes a superb specimen for the patio. 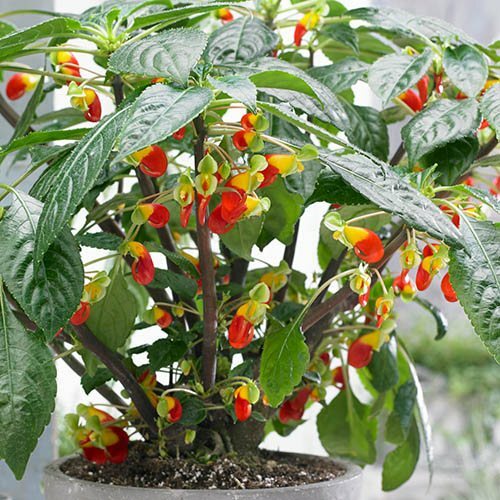 A plant with instant appeal and not often available to buy, treat your garden to something a little more out-of-the-ordinary and grow the exotic-looking Parrot plant (Impatiens niamniamensis). Also known as Congo cockatoo and parrot impatiens you'll see why straight away - the waxy blooms of yellow and crimson resemble tiny red and yellow birds perching on slender stems! A tropical relative of the ordinary garden impatiens, it's very similar in its likes and dislikes. Fascinating for children and adults alike, it's easy to grow and propagates easily, just like a normal busy Lizzie. Grown as a flamboyant pot plant in the greenhouse or conservatory where it can reach over 4ft, the parrot plant will also perform in the garden or on the patio. Just give it a position in partial shade, in moist but well-drained soil and it'll happily produce its little parrot-shaped flowers all summer. Best grown in a pot in the conservatory or in a warm spot on the patio, the Parrot Plant will also do well in a warm, partially shaded border. Keep well-watered, but do not allow your plants to sit in wet. Deadhead and feed plants regularly for a continuous display of blooms. Plants are not hardy, but can be overwintered in a frost-free, cool room.